Coat a 13x9x2-inch glass baking dish with cooking spray; place bread cubes inside. Sprinkle blueberries on top. In a large bowl beat Neufchatel cheese until smooth. Add sour cream, brown sugar, packed, milk and maple syrup, continue beating until smooth. Add eggs, cinnamon and vanilla extract; continue beating until mixture is blended. Pour over bread and berries. Cover with foil and refrigerate several hours or overnight. Bake covered in a preheated 350°F (175°C) for 30 minutes. Uncover and continue baking until no signs of visible liquid egg or about 20 to 25 minutes longer. 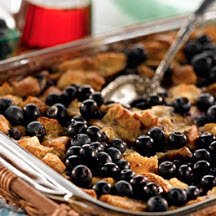 Sprinkle remaining blueberries on top and serve with additional maple syrup if desired. Refrigerate leftovers. Nutritional Information Per Serving (1/10 of recipe): Calories: 418; Total Fat: 17g; Cholesterol: 247mg; Total Carbs: 52g; Fiber: 2g; Protein: 14g; Sodium: 441mg.